Apparently, the infamous mohawk from the mid-80's extreme ski scene, Mr. Glen Plake, has played a lead role in the 3-year development of the Dalbello Virus Tour I.D. alpine touring boot. The Virus Tour I.D. is a three-buckle boot that performs more like it's alpine four-buckle boot cousins. 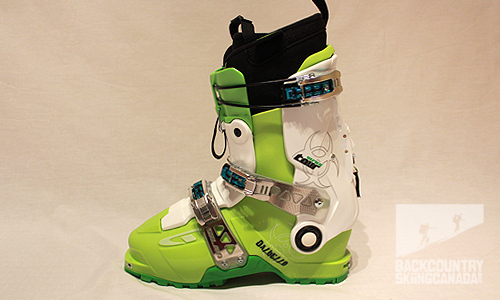 At 3312grams (for a pair of size 26's) this isn't the lightest boot on the market but it easily rivals those from of the big backcountry brands. If you are seriously concerned about weight then you may want to look into the VIRUS Lite I.D. 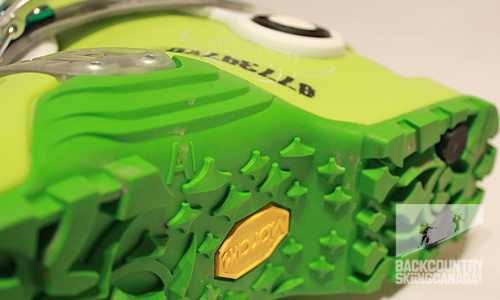 which weighs 98 grams less per pair thanks to the use of Pebax plastic which is 20% lighter. The main features of the Dalbello Virus Tour I.D. are the 2 piece BioStride tongue, Cabrio design and Dynalink retention system. I know that all sounds like a bunch of marketing speak so I lets see what is behind each of these. The Virus Tour I.D. tongue has essentially been split in two and is held together by a rather simple latch mechanism. Why would Dalbello do this? It adds an additional point of articulation to the cuff which results in a broader range motion for walking or skinning. Think of it as a second hinge point on the tongue just below the top buckle. 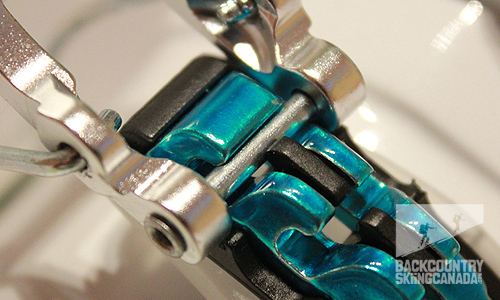 This permits more rear motion of the upper cuff. "Rear motion" I hear you say? Yes, it does nothing to improve forward flex which you need most while skinning up steep slopes, but does give you more backward flex on the flats. So there is some benefit here but it would be nice to be able to reverse engineer this to to go the other way around. 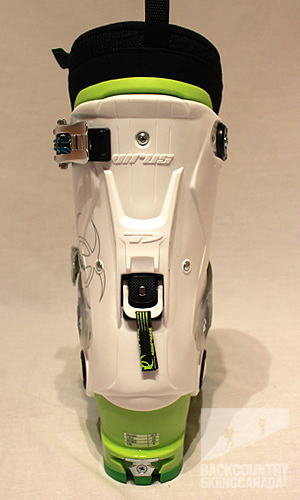 The big plus of the BioStride tongue is that you can increase the boot flex while still being totally buckled up. At the core of Dalbello's boot designs over the past decade has been the three piece Cabrio Design architecture, it incorporates separate structural elements for the lower shell, upper cuff and external shell tongue. This configuration allows for easy on and off compared to the clam-shell design while still securing your foot in relative comfort. It may not have the widest range of movement on the market but it does allow for ample flexibility and has the ability to hold your foot really securely. The middle buckle of the Dalbello Virus Tour I.D. 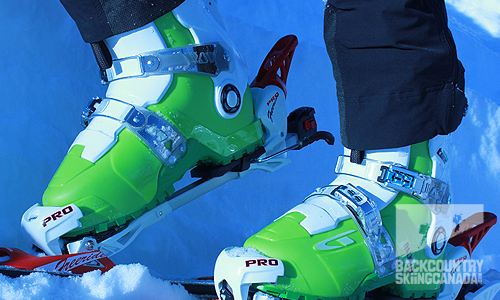 crosses over the arch of your foot effectively securing your foot towards the rear of the ski boot where it can be held securely and limit upward motion of the heel. When the Virus I.D. flexes the Dynalink band does not permit the foot to slide forward or the heel to lift inside the boot liner or shell. 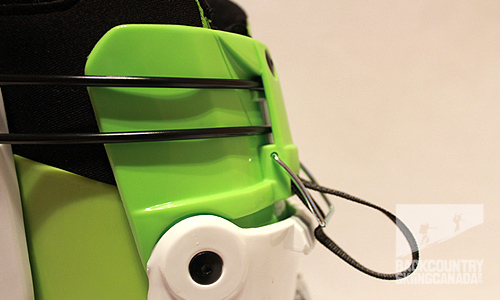 The Dynalink system (as they call it) also prevents the lower shell from distorting or bulging with forward flex. 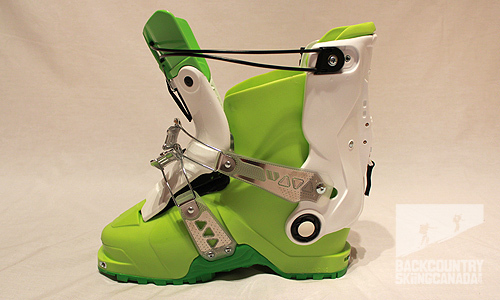 Call it what you will, this location is ideal for a middle boot buckle as it secures the foot and enables an effective transfer of energy from skier to boot to ski. Two other features which are worth talking about are the Dalbello Virus Tour I.D. buckles and Liner. 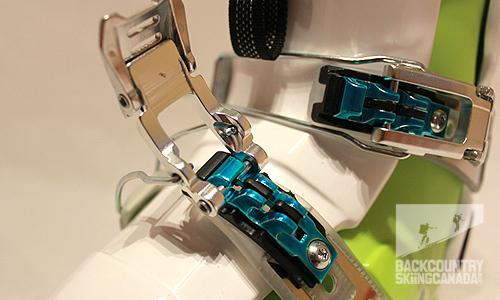 The reasons the buckles are unique is that there are delrin plastic clips integrated into the buckle ladder assembly which allow the buckles to be opened without completely disengaging them. 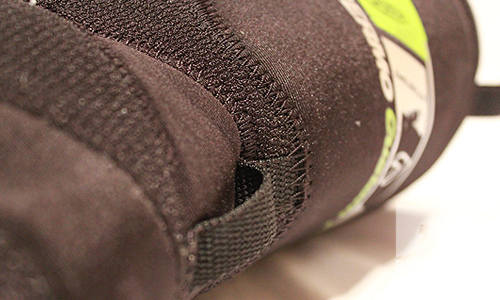 This provides your feet more room to roam while walking, skiing or a simple breather at break time. All of the buckles have been designed to be 'inboard' which mean they are less likely to catch when you're post holing to the peak amongst the rocks (a pet peeve of mine). The Dalbello Virus Tour I.D.liners are called "Trufit", which are designed to fit right out of the box as mine did - however they can also be heat moulded for a better custom fit. The liners provide great support as they are quite ridged and are cut nice and high with a lace-up system. They are made of a combination of Ultralon® HD + Enact™ with high density elastic foam resin. They have a multi-laminated forefoot & toebox and incorporate 'EZ Walk/Flex Design & Construction' which is essentially strategically placed flexible fabric to aid in flexibility. Sole: Soft vibram sole wrapped all the way along the arch so you don't slip on rocks with 4 Quadrablock stability pylons embedded in to minimize wear. I have to be honest, the word Dalbello and the term backcountry skiing were not synonymous for me. In my mind Dalbello made great Alpine boots but like all companies racing to join the backcountry skiing gear gold rush I feared an inadequate retrofit was on the menu. I am glad to say I was wrong and pleasantly surprised by how competitive the Dalbello Virus Tour I.D. boot was with other well-known touring boots on the market. The Dalbello Virus Tour I.D. 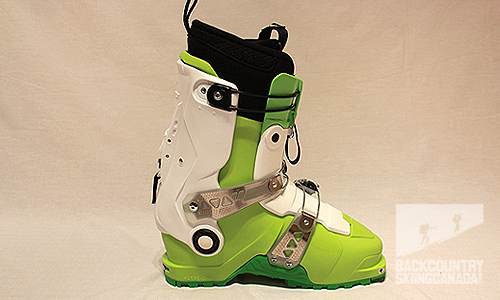 is relatively lightweight and offers good flexibility on the uphill with a secure alpine-boot-like feel on the down. The toe box provides ample room for your digits to roam and in combination with the Ultralon HD liners keeps your feet toasty warm. 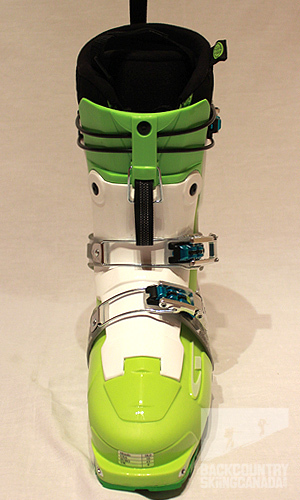 This is a stiff boot that is responsive and is able to deliver power to your skis, thanks in part to the high tongue and Cabrio Design. It offers great support and stability while providing oh so important foot comfort. The forward lean is approximately 14° which is on the thin side however I did not find it impeded my skiing ability and may actually have reduced the pressure on my shins as I don't seem to get shin bang with these boots. On the down side I did find the buckles next to impossible to undo whilst wearing gloves, which is a major issue for this reviewer. 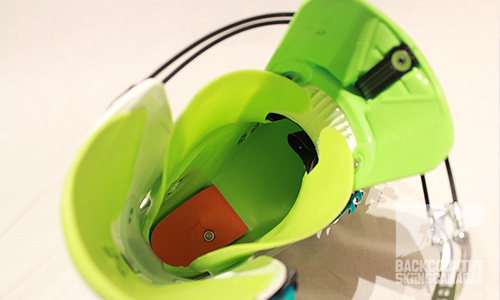 That and the ability to micro adjust the buckles are missing 'must haves' for this boot. While the BioStride tongue is a great idea it did not provide much flex on the typical skin track - if it could be reversed so that it allowed more forward flex then it would be a game changer. Those many years of alpine boot manufacturing know-how have paid off for Dalbello, they make a mighty fine AT boot and I am looking forward to what comes next. A big shout out for Rob at ROAM here in Nelson BC for his continued boot fitting expertise. Thanks. If you want to have a look at other Dalbello ski boot reviews mouse your way over here to read the Dalbello Sherpa 2/8 AT boot review. Stiff, stable and responsive feel while providing great support and comfort in a light AT boot that is Tech compatible. Cabrio design rules. BioStride tongue is a great idea - even better if it could go the other way? Liner laces need to be shortened by five inches. 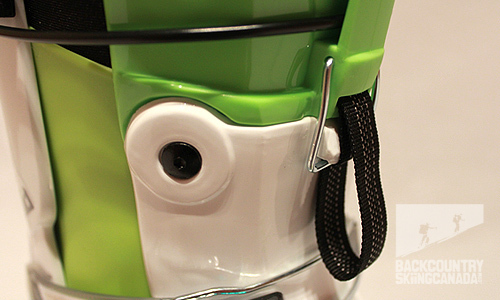 The boot Buckles are frustrating, they simply do not open easily and need to be re-engineered. Were it not for the buckles I'd be giving this boot a five out of five. I am a big fan of the Dalbello Cabrio split shell design, these were my resort and side country ski boots for more than a year. That is until the new Dalbello Sherpa 2/8 ID AT boots came on the market this season. I switched over to the Dalbello Sherpas as they were slightly stiffer and offered an Intuition wrap around liner which has proven to be way more comfortable than the liners in the Virus Tour ID boots. 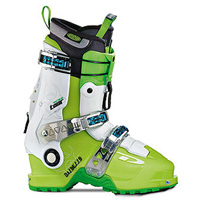 The Dalbello Sherpa boots don't have tech fittings which I would have liked but truthfully if I was going to ski a pair of tech bindings I would switch over to my ultralight Dynafit One AT boots. Still, the Dalbello Sherpa 2/8 boots are a great resort and backcountry boot and since the Dalbello Virus Tour ID boots are no longer being produced you may as well give the Sherpas a try, I think you will be surprised at how well they perform.